Every single automaker needs a three-row SUV to compete in today’s crowded market. After a couple of years with some less-than-positive headlines, Volkswagen needed a win from their first-ever three-row midsize SUV. 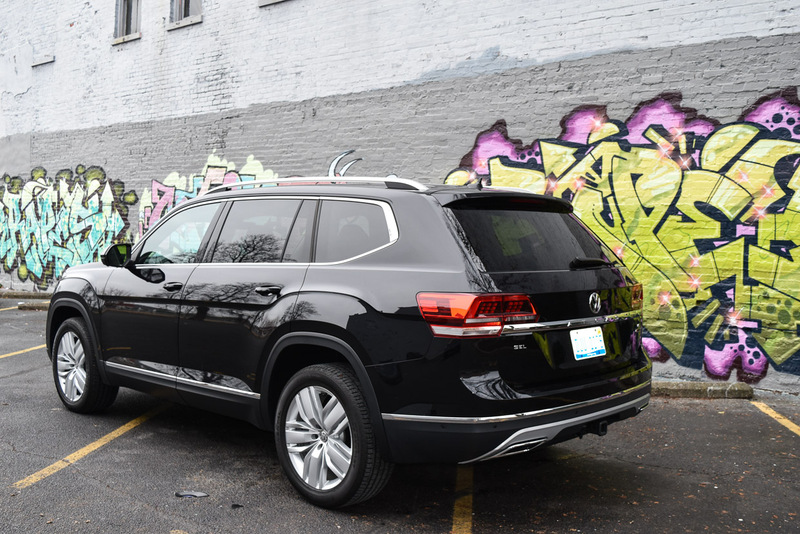 And they got it with the 2018 Volkswagen Atlas. Sometimes as an auto journalist we can get a little too glowing and use too much hyperbole. 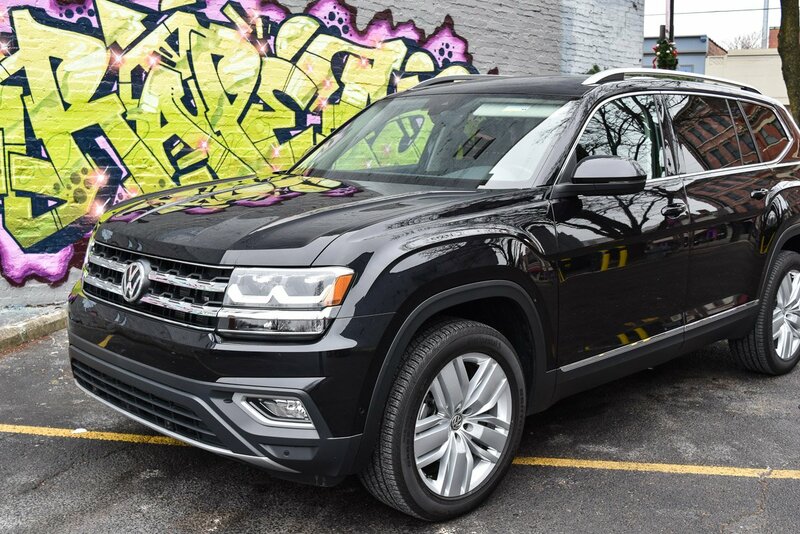 But I want to make this clear, the VW Atlas is the best Volkswagen in decades. No hyperbole, no exaggeration. 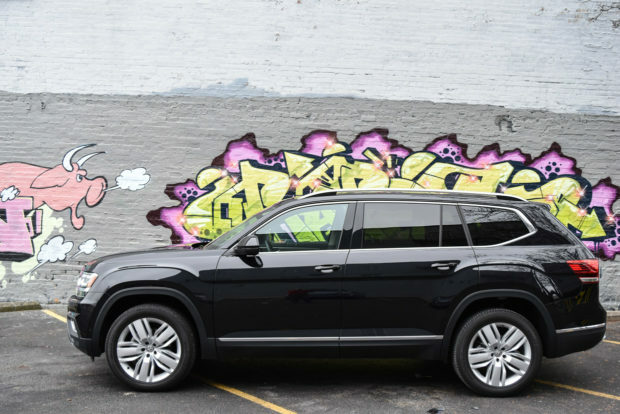 It’s a legitimately good SUV that is well-priced and has plenty of room and great features. Additionally, this VW feels more American than German. Whether that’s a good thing or not, probably depends on your tastes. But clearly, Volkswagen made this SUV with American tastes in mind. It’s even manufactured in Chattanooga, Tennessee. It’s practically dripping with stars and stripes! 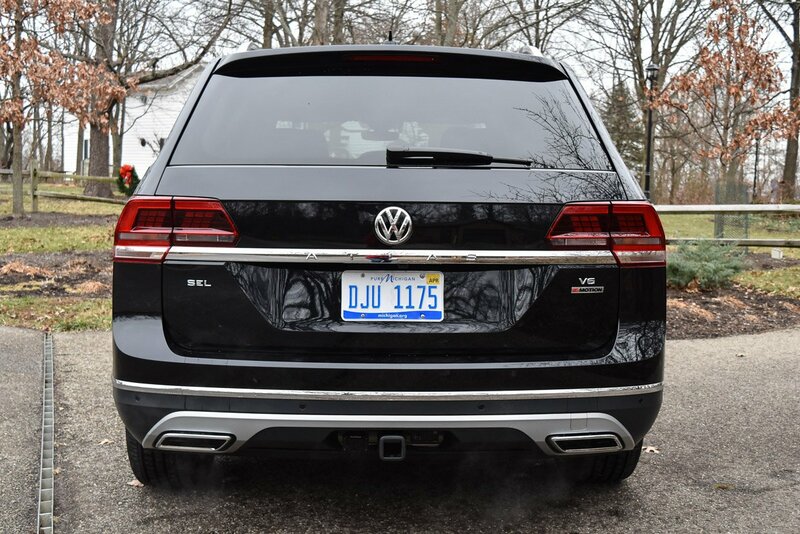 For the consumer who was confused by the weirdly named Touareg, this is the SUV built with you in mind. On looks, the Atlas is muscularly sculpted, but still has a conservative vibe. That’s not a negative, but rather consistent with Volkswagen’s design aesthetic in general. They opt for vehicles that don’t get outdated with overly frilly design elements. As such, the Atlas should remain current with its attractive exterior for several years. 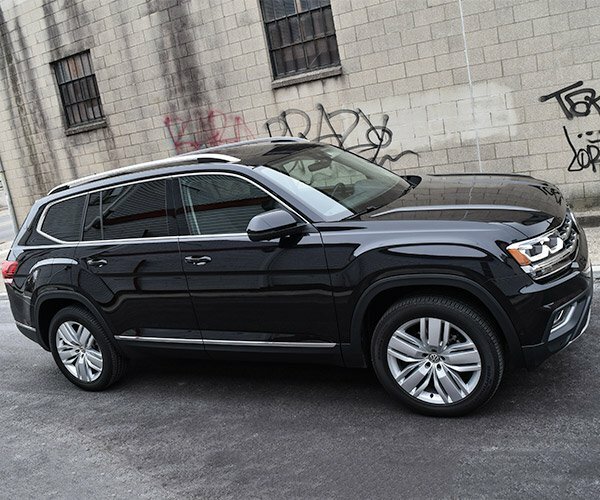 The Atlas is the biggest VW available in the U.S. market. It is 198.3 inches long with width and height dimensions of 78.3 and 70 inches respectively. You could see genesis of this SUV several years ago at the Detroit Auto Show when VW showcased their CrossBlue concept. It was a little over the top, but I still remember that front end and said, boy I wish they’d make an SUV that looked like that from the front. The Atlas bears a lot of resemblance to that concept with its well-designed front end that features LED lighting. The headlamps flow perfectly with the rest of crossbar grille, and are distinctive at night as well. On profile, the Atlas loses some of its distinction and is homogenized with many other SUVs on the road. But it picks back up with the distinctive looks of the back end, which also feature LED tail lights. The same crossbar styling on the front equally matches it on the back adding a consistent, attractive look to the Atlas. A smally rear spoiler is a nice design element as is the dual chrome exhaust. You can’t launch an SUV in today’s U.S. market without offering multiple engines. 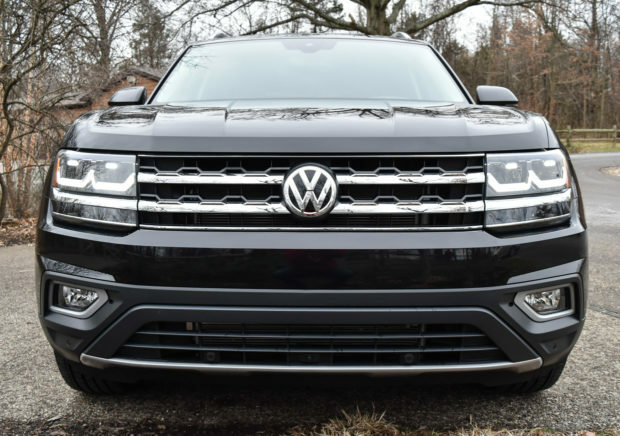 VW does so in the Atlas which is available with a 2.0-liter turbocharged four-cylinder engine and also a 3.6-liter VR6 engine. The smaller engine, with the turbocharged, direct injection makes 235 horsepower and 258 lb-ft. of torque. My SEL Premium tester had the larger 3.6-liter engine which delivers 276 horses along with 266 lb-ft. of torque. The German engineering really kicks in on this engine as it’s quick off the line and offers good performance at all speeds. The eight-speed automatic transmission is efficient and smooth. The AWD Atlas has an EPA rating of 17 mpg/city and 23 mpg/highway. In a week’s worth of driving, on and off the highway, I averaged nearly 20 mpg. I was satisfied with the fuel economy considering how enjoyable it is to drive, and how much it can haul. The 3.6-liter version is so capable it can handle a towing load of 5,000 pounds, just the expected level of towing capability in the segment. My tester had Volkswagen’s 4Motion all-wheel drive system which helps reduce wheel spin and gives better control in all road conditions. Additionally, it came equipped with Active Control which allows the driver to choose a vehicle profile based upon the driving conditions. It has on-road, which is the default setting, snow mode (great for all of us in this dreary winter weather) and off-road. I did not test the off-road, but I’ve seen videos of the Atlas looking quite comfortable in rough terrain and using Hill Descent features. It’s not a Jeep or a Land Rover, but it’s certainly capable of getting some mud on the tires and venturing off the beaten path. Inside, the Atlas offers a luxurious look. In fact, it’s the nicest interior of any Volkswagen I’ve been in. At times it almost felt like an Audi. Almost. The SEL trim has leather throughout. Up front, you’ll find heated and cooled seats. Plus, three-zone climate controls assures that all passengers will be satisfied. A power tilting/sliding panoramic sunroof floats overhead. The Atlas also feels big inside. 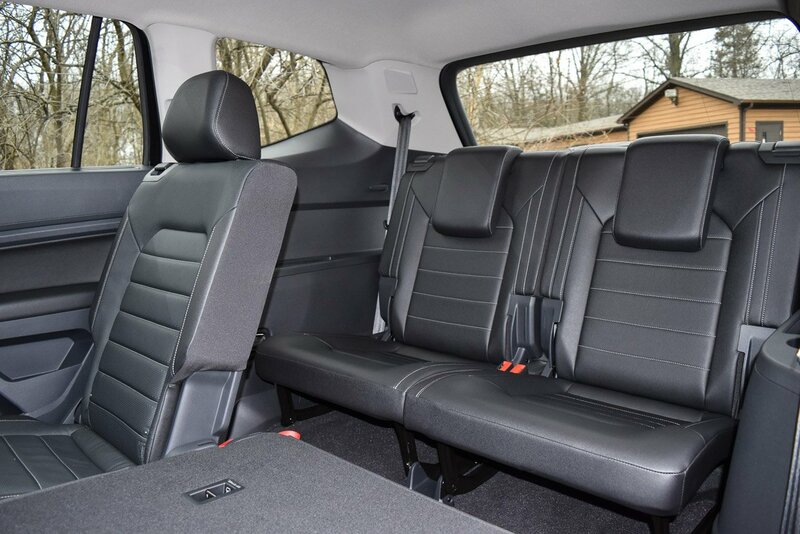 Passengers will not feel cramped in the second row, which has bench-styling seating that folds 60/40. The middle seat also has a pull-down center console that doubles as a cup holder and an armrest when there are only two passengers in the back. There’s 37.6 inches of second-row legroom and 33.7 inches of third-row legroom. The third row is actually comfortable for most adults, and the second-row tilts at a good angle to make accessing the third row easy. Additionally, the second row seats can recline at a 14-degree angle for added comfort. With the third row upright, there’s 20.6 cubic feet of cargo space. Fold the third-row flat and there’s 55.5 cubic feet of space. 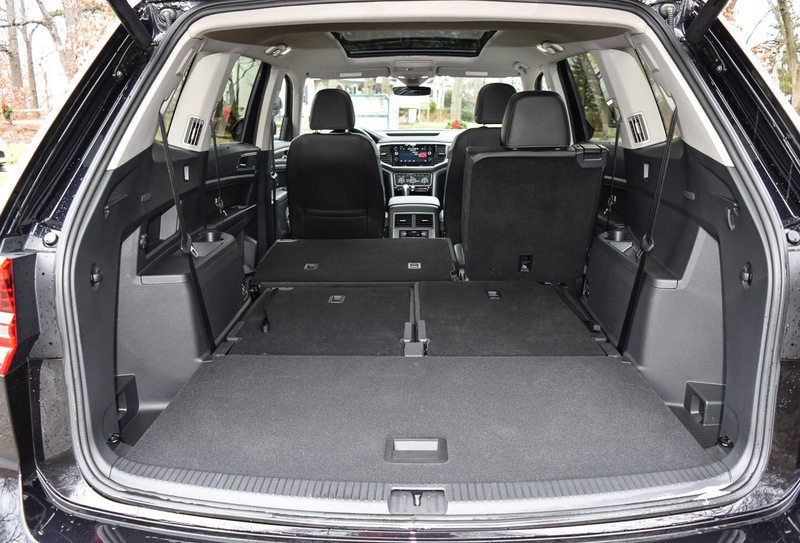 With both rows folded, the Atlas boasts an enormous 96.8 cubic feet of cargo room. 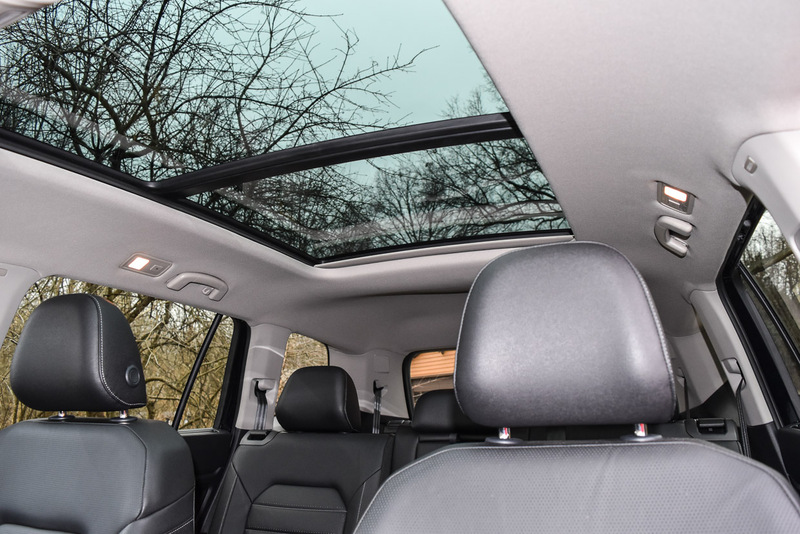 The cavernous, useful interior space is one of this SUV’s best traits. Volkswagen brings the digital cockpit feature found in their Audi brand to the Atlas. This is such an innovate and cutting-edge way to present information to the driver and keeps the eyes straight ahead too. 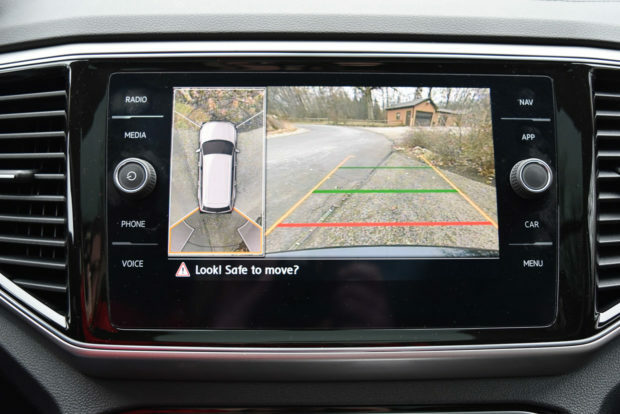 This is one of my favorite technologies found in vehicles today. 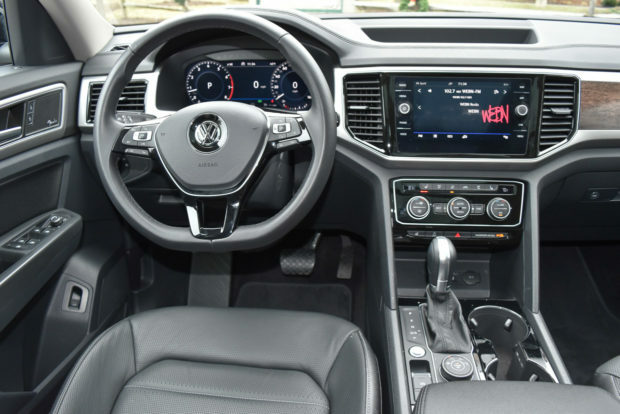 The infotainment system is also a major improvement from other VW vehicles I’ve driven. As mentioned, they’re now more like an Audi than ever before. The 8-inch touchscreen is responsive. There’s a USB port and smartphone integration through Apple CarPlay and Android Auto. All-in-all, the technology found within the Atlas is as good as any Volkswagen I’ve driven. Combine that with the luxurious feel and the Atlas exceeds the competition in comfort and tech. The Atlas has a dizzying variety of trims and options (typical for German vehicles). My tester was the V6 SEL Premium w/4Motion. The base price of this trim is $48,490. However, the base model 2.0 S with front-wheel drive, and the smaller engine has a starting price $30,750, so if its the space you’re most concerned with, you can get into an Atlas at a very reasonable cost. After a number of years of uninspiring SUV models, Volkswagen now offers a viable, engaging SUV here in the U.S. market. And for the first time, it’s well named. I’d do an ad campaign called At Last – Atlas. Because this is the vehicle VW has needed, especially after the last couple of years they’ve had.